Check out this exclusive interview with cute Zachary Levi about Disney’s animated film, Tangled, which is out on Blu-Ray and DVD on March 29! Zachary plays the voice of Flynn Rider in the movie! How would you describe your character in Tangled? 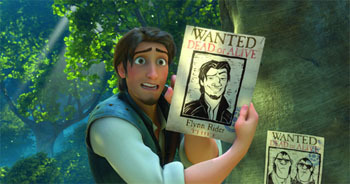 Zachary Levi: Flynn Rider is a dashing bandit. He’s a good-looking, swashbuckling dude who always gets the ladies. I like to think he’s got a little of me in him. Well, that’s what I’ve been told! What happens in the movie? Zachary Levi: Tangled is filled with comedy, drama and romance – and it was a lot of fun to work on. It is the story of Rapunzel, the princess with long, golden hair. Flynn and Rapunzel go on a crazy adventure together, and we all go along for the ride. How does Flynn meet Rapunzel? Zachary Levi: At the beginning of the movie, Flynn is being chased by palace guards and a horse called Max. He stumbles across a secret valley and he needs to hide, so he shimmies up to the top of a tower – but he doesn’t know that Rapunzel is waiting inside. Does Rapunzel welcome Flynn into the tower? Zachary Levi: No, she doesn’t. She hits him around the back of a head with a frying pan – and Flynn is knocked out cold! How much fun did you have in the recording booth for Tangled? Zachary Levi: It was super fun in the recording booth. Sometimes I would just roll in and I hadn’t even showered, but it didn’t matter because it wasn’t like I was going to be on camera. I didn’t tell the producers that I hadn’t showered, but they could probably smell it. Let’s keep that as our little secret. Did you find it easy to record your voice for the movie? Wow… That sounds like a lot of fun! Zachary Levi: It was extremely fun, but I also found it a little strange because Mandy Moore (who voices Rapunzel) and I didn’t record our dialogue together. We recorded the song together, but that was about it. The rest of it was just a microphone and me in a sound booth. Zachary Levi: I’m not sure if it was tough, but it was a very cool and unique experience because I got to explore my voice and I got to bring a character to life. I could be silly and I could act a fool because no one was watching me other than the directors and the producers. That was very freeing. How does it feel to be the voice of a new Disney character? Zachary Levi: Are you kidding me? It’s amazing! A friend of mine went to Disneyland yesterday where she saw Rapunzel in the park. She said to me, “I can’t get away from you!” I replied, “Well, good. I’m glad you can’t.” I’m glad this is turning into something really cool. How excited are you at the thought of being made into an action figure? Zachary Levi: Of course I am! I had a buddy who was in the movie Avatar and he got an action figure – but it wasn’t the same. His action figure was way buffer than he is in real life. I get to be Flynn, which isn’t exactly me – but I know it is deep down. I couldn’t be happier. What went through your mind when you saw the finished film for the first time? Flynn sings in the movie. Were you scared about warbling for a huge Disney movie? Zachary Levi: No, I was fine with the singing. To be honest, I’ve sung all my life. I’ve appeared in musical theater before, so I was looking forward to it. I’ve grown up singing Disney songs all my life, so it was an added bonus. What Disney songs did you grow up singing? Zachary Levi: There are so many of them! There’s A Whole New World and Never Had A Friend Like Me from Aladdin. And then there’s Be Our Guest from Beauty And The Beast. I loved all that good stuff. What were your favorite animations when you were growing up? Zachary Levi: Aladdin was probably my favorite Disney animation when I was a kid. The animation was great and Robin Williams was unbelievable as the Genie. What else made Aladdin stand out for you? Zachary Levi: Aladdin was an amazing adventure and the lead character was a hero for guys, which I loved. It wasn’t a princess or a girl beating the odds; it was a street rat. That seemed really cool to me. What other animations do you rate? Zachary Levi: After Aladdin, I really like the other Disney classics like The Jungle Book, Robin Hood and The Rescuers. Beyond that, there are a number of Disney shorts that I rate that were incredibly well made. Zachary Levi: Sure! Shorts called Johnny Appleseed, Pecos Bill and Paul Bunyan are all amazing. You’ve got to check them out if you haven’t seen them. Let’s talk about the animation of Tangled… Are there any secret Disney references hidden in the artwork? Zachary Levi: Do you mean hidden Easter eggs? Well, there’s one that stands out for me, but I don’t know if a lot of people got it. There’s a crazy goat in the Snuggly Duckling scene and I’m convinced it’s the goat from the Big Thunder Mountain ride at Disneyland. Where can we see the goat on the ride? Zachary Levi: He’s on one of the last drops of the ride. He’s standing there chewing dynamite. I’m sure that’s him! I’m pretty certain the goat in the Snuggly Duckling is an homage to that goat on the ride. I think that’s really cool. And finally… Why should we buy Tangled on DVD? Zachary Levi: Why? Well, I’m in it! Is that not reason enough? If you want more of a reason, I think you should buy Tangled because I believe that this is going to be the first fruits of the next generation of Disney animated films. I hope there is going to be a whole bunch of new musical animations because I’m really looking forward to watching them. Fingers crossed I get another calling saying, “Hey, Zach… Do you want come back down to the studio and do some voiceover work for us?” I’d be there in a flash. What's the Best Part of Disneyland? I like meeting all the characters and getting autographs. There are tons of cool shops. I'd rather be home watching TV.